After reading dindin's Report of his Pfaffenhofen-refight I decided to give it a go again. Before first I thought that it maybe is not really balanced and that this is not really my fault - OK except the victoryconditions - but a historical problem. Outnumbered or outflanked is allright. But outnumbered and outflanked? My goodness! Thirdly I had not the real push to do it. For this time I played Ségur and Zastrow. My dear wife had the Austrians. I hoped to have a lesson from both: my own game long ago and Dindin's refight. have some problems to post our Pictures. But I want to write now my report before I forgot most of the game. My plan was fairly simpel, just to fall back with my whole army and not to split any brigade. 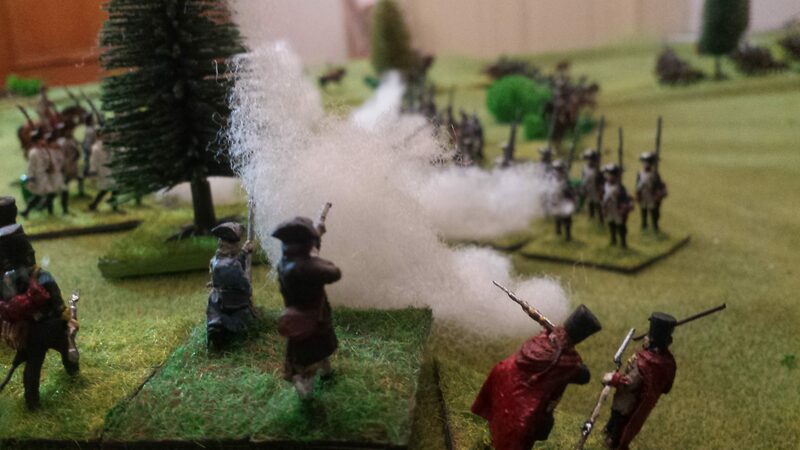 I thought that to split Rupelmonde's brigade was one of the major faults of our last refight of Pfaffenhofen. With this tactic it made no difference if Zastrow or Crussol would roll a 1 or 2 because I could fall back than too. Batthyány had more problems as sometimes Pálffy ignored the orders. But he had Serbelloni, who had now the most important order to stop my retreat towards Rain. I had the luck that Trips commanded his pandours to charge one of Ruppelmonde's best batallions. I have to say, that I positioned them on my left flank because I did'nt believed that Zastrow's Palatines could deal with them. Even with 2 units charging one of elite Infanterie étranger in front and flank I had the luck to destroy one of them. The other had to fall back. As the Austrian line infantry didn't advance quick enough I could stay with Zastrow's batallions where they were and that was fine, because than Trips could not rally his pandours and they had to leave the battlefield. Now one of the flanking enemies was gone. I had a lot of luck with Rupelmonde who managed to move his batallions very fast. 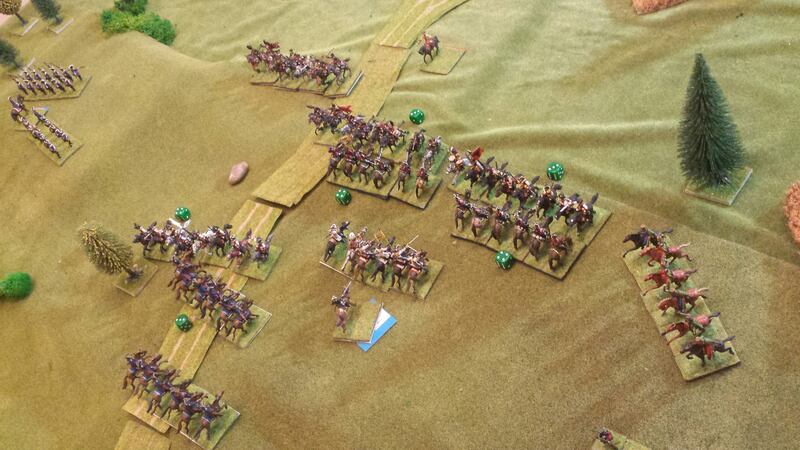 Serbelloni had only one chance: to attack with all his cavalry in my poor horseman. He did and the result was not too bad for me. Serbelloni could charge with 2 units of cuirassiers and one of dragoons. Two of Crussol's horseunits had to retreat (which was his task anyway) but one of them could beat a opponent. What a surprising outcome! Serbelloni had heavy losses (3 hits on 2 and 4 on 1 unit) and had to lick his wounds. That was really important, because it gave me enough of time to pull back my main forces. Only one of Rupelmonde's batallions had casualties! 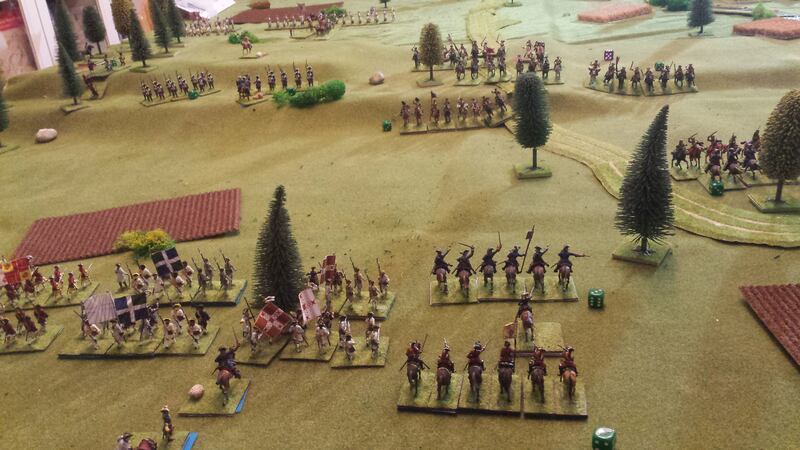 Now Batthyány changed his focus to his only brigade which had a small chance to catch my infantry: Pálffy's Brigade of grenadiers. It seamed that Pállfy had no inclination to march fast and hit hard. General Batthyány had to come along and order him in person. At the same moment when Batthyány's last pandours destroyed the first of Crussol's horseunits with a good volley, Pállfy's grenadiers had to charge. But Zastrow's lads shot very fine and the tattered Austrian Grenadiers fought until their death. Both units were destroyed at once! I'm loosing my first unit, shot by pandours! So now the Austrians had lost 4 Units and I lost just one. I myself was really surprised how well my tactic worked. 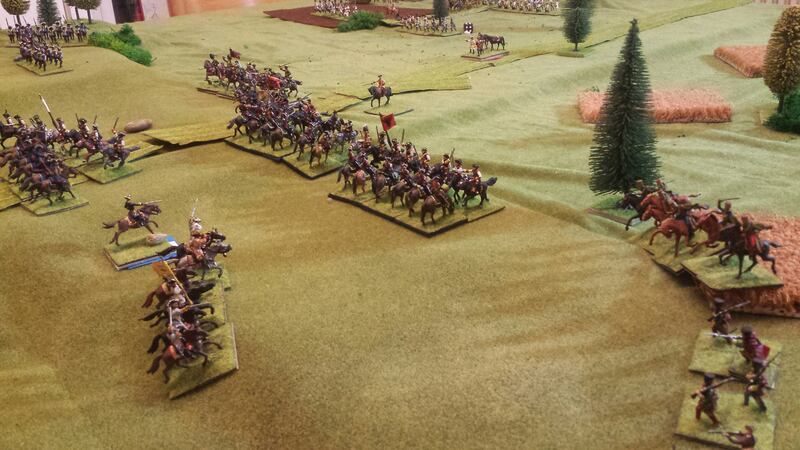 Next (turn 10) I managed to bring 1 of Crussol's cavalryunits, 3 of Rupelmonde's batallions and his artillery in savety. Yes, I did'nt used the artillery ad all because I thought that every General would be very happy to save his guns. Not a real problem this time. Just limbered and send back and I just had to observe that the artillery stayed in the command distance of MdC Rupelmonde. Mercy had ignored several orders. It was to late when Generalfeldwachtmeister Serbelloni charged with everyone. The Austrians encircled one of Zastrow's batallions. A spend force. The other Austrian cavalrytroops attacked Crussol's cavalry. But that could not prevent Rupelmonde's retreat. He brought his last 3 bn.s off the battlefield and that was victory. 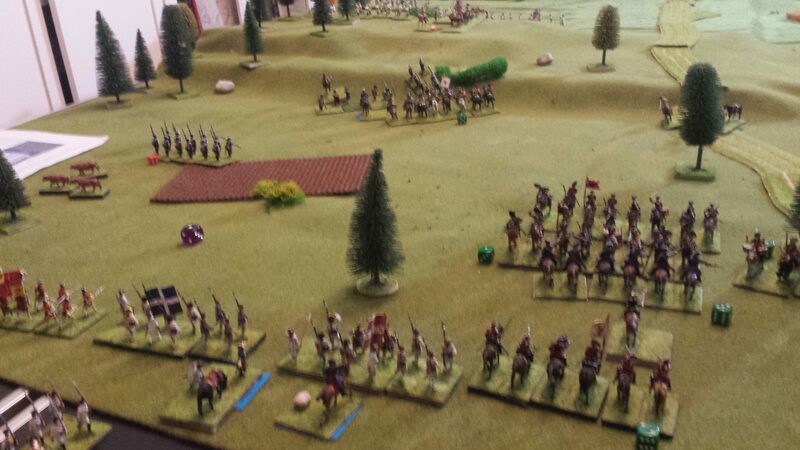 It was a successfull tactic to move the French infantry as fast as it could just backwards facing the enemy. To face the enemy had a strong psychological Impact. 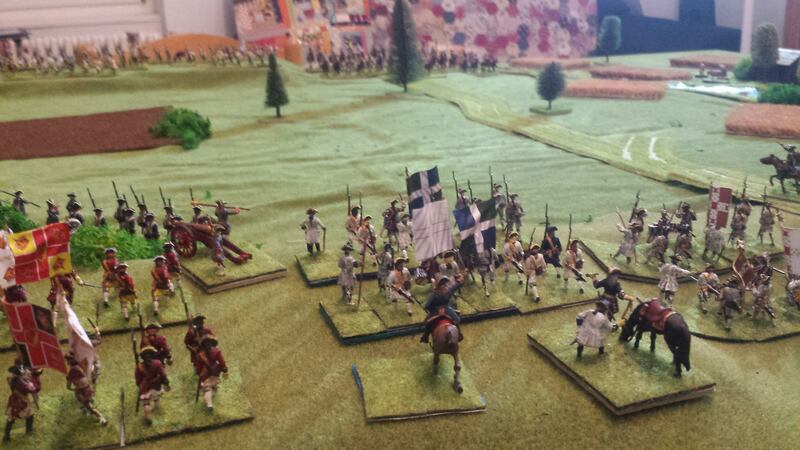 Even with small batallions, Rupelmonde's infantry was close order infantry and had no hits. 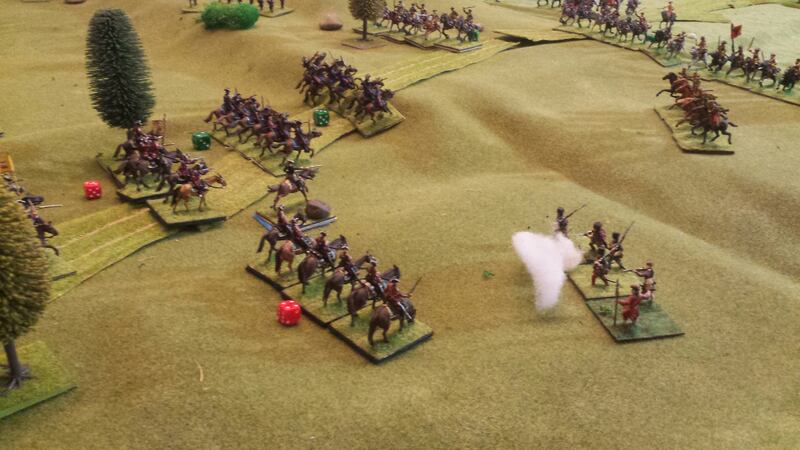 But Serbelloni's Brigade had heavy losses and maybe he could loose some Units attacking fruitless my French infantry. 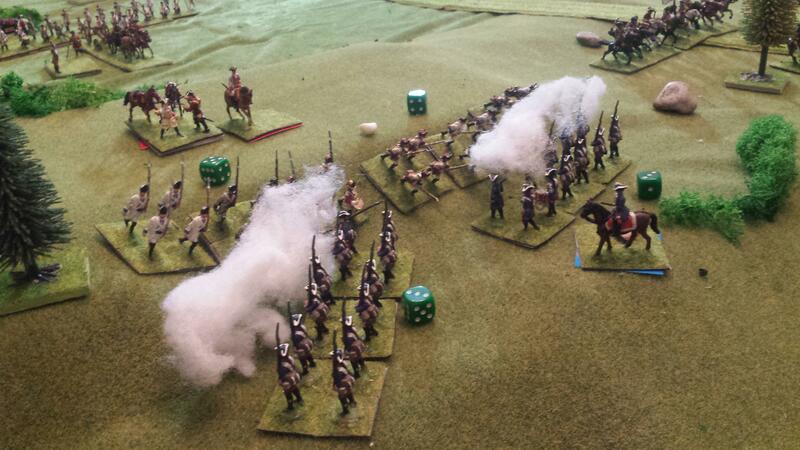 Secondly I decided to use the weak wings to deal with Trips and the other Austrian light troops. 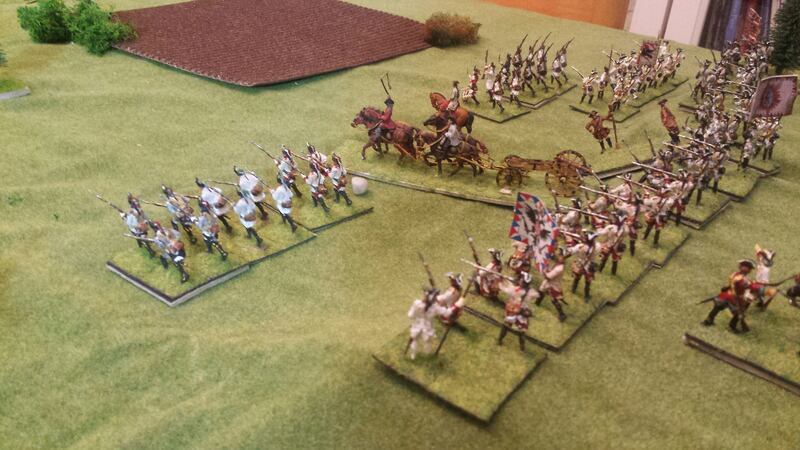 Thirdly the Austrians had some bad luck. Mercy did'nt moved for 2 or 3 turns. Without these forces, Trips could be isolated and of no use. Even in melees the Austrians had no luck at all. Losing the pandours under Trips and both of Pálffy's grenadierunits was real badluck! First of all I feel delighted that my Pfaffenhoffen game was a source of inspiration for you, to refight this game one more time. As I said in my AAR, every time there may be another game outcome. So, it seems that your cavalry brigade had the luck not to be destroyed so easily as mine (which received also a flank attack from the independent hussars and flanking fire from the pandour accompanying unit). Your tactic proved successful, it is interesting that you did not use your battery at all (to save the guns), but it worked! The real challenge would be to include in the scenario some extra reward for the French side for saving Zastrow's units, because my impression is that the Palatine infantry is doomed. Eager to see the pics from your game! Cheers! Now I added the photos. Zastrow's troops run away early in the historical battle and Rupelmonde acted really bravely rallying the French infantry after the Palatines passed through the French lines. I think that I placed the Palatines according to the descriptions of the battle and the contemporary plan drawn by a frenchmen - perhaps to excuse Ségur's faults. 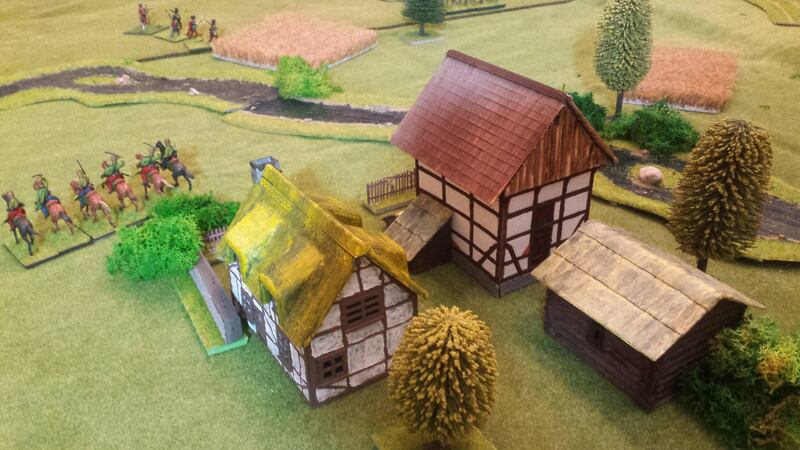 Now, with photos added, it is a very nice and comprehensible AAR. As French you managed to conduct the battle very well. It was to your advantage that you managed to repulse Trips' Pandours threatening your left flank, this minimized your probable hits you might receive during retreat. Also, I would expect the Hussars of the independent unit to coordinate their attack with Serbelloni, attacking your cavalry from the flank. In any case, when somebody refights a battle, he has acquired the knowledge of his previous faults, so he may have advantage against an opponent who plays the game for the first time. 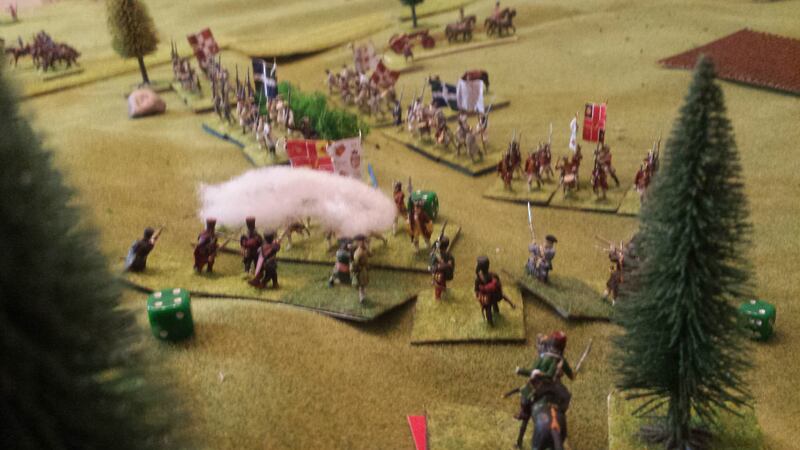 Trips' Pandours flank marching against the French left flank, are really a headache! If it happens you to be an umpire in another refight and the French player is a novice, I suggest that you keep secret the presence of Trips' flank march at the start of the game. All in all, it must have been an enjoyable game! Cheers! I suggest that you keep secret the presence of Trips' flank march at the start of the game. No, I think that Zastrow or Rupelmonde could see Trips units from the first turn. Pfaffenhofen was a battle with several situations, which are interesting. First I thought about the chance to start with the moment, when the Austrian Avantgarde attacked the town of Pfaffenhofen and Crussol ordered the evacuation of the garrisson. 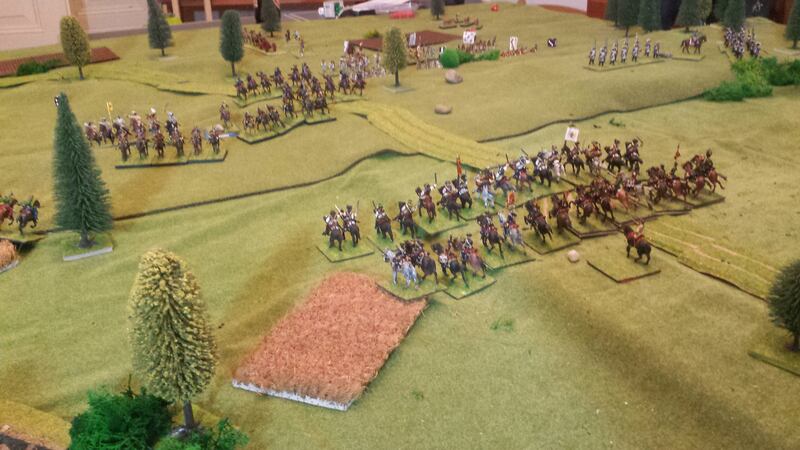 But than the battlefield would be very large with only some troops scattered over a large area. 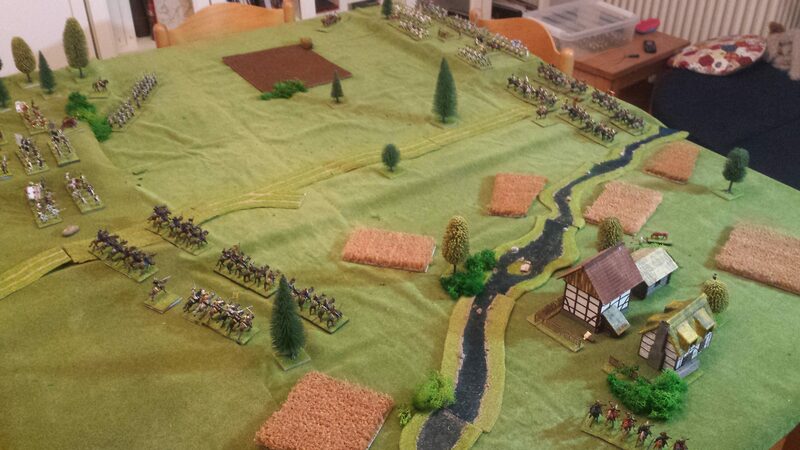 At the end of my research and decissions I decided to reflect the Situation when the French were in their second position after loosing Pfaffenhofen, but before the Palatine troops faltered. I suppose that at this moment the Trip's Austrian light infantry reached the edge of the woods. I think that you chose the right moment to reflect the situation of all troops, it makes the most interesting scenario. I'll keep in mind all what you have said in case we refight this battle, thank you!